Perhaps they did that because tiny BB was done against green green and Matt was available for tapping that day when Carroll was not. I thinl it is a good idea to mix p BB voices. This way kids can easily get use to the change when Matt eventually takes over. Sad to think about it, but Carroll wil have to retire some day. And instead of scrambling to find a replacement when Carroll retires, they are training Matt now and using him and it will be a seamless transition. If we had a Muppet series on the air when Frank left the muppets we might have seen a similar thing happen with his characters just like it was done on Sesame Sreet. I think Oscar should be handled in the same way as BB. I've only heard Carroll's Oscar i new seasons. It would be a good idea to start alternating and get everyone use to it. Since Eric was cast as Guy Smiley for this museum thing, why don't they try him out on the show? Why not let him host some healthy food game insead of that weird guy that shows up who sounds like a creep with a flat top? I see. Thanks for the info about Matt. It's good to know Big Bird will be in good hands after Carroll Spinney stops performing him. Hey, was wonderin' if Secret Squirrel could settle something for me. Of the spoofs announced for Season 36, the one that intrigues me the most is 24. So, does this mean that Sesame Street will finally surpass the 21 Number of the Day barrier? Will they start to feature higher numbers as the Number of the Day? Will wait for answers, and till the sketch airs. Hope to hear from you soon, and looking forward to the rest of the season and what new additions to the list it holds. Count. Some secrets are best kept secret. Well... That's understood. Besides, I can wait till September to get the info of the sketch and the characters anyway. Wanted to know, there are some questions I have regarding characters past and recent I've found for the list. Would it be OK to ask you about them? They're mostly cast related, trying to get actor names. LMK if it's OK to ask and I could send you the questions personally. Thanks and hope you have a good holiday weekend. Secondly, thanks for all the info, Secret! You really cleared things up for us. Thirdly... I probably have no plans to go to whatever Museum the SS tour is located. Is there anyway to hear what Eric Jacobson's version of Guy Smiley is like? I never heard Steve Whitmire's Guy (or his Link Hogthrob for that matter), and I've heard someone dubbed his voice for a computer game. anyone have a sound file of that? It's also good to know Jerry isn't out of SS (though he was clearly absent in OZ). Though I do think he was dubbed in the "If I wuz a cloud" episode. Secret Squirrel... one more thing. There's been a new Muppet on Sesame Street lately, a maroonish reddish monster with a big furry jaw. He's been talking to kids on various segments. Any idea what his name is? He's been unnamed in all his skits so far. #4100 airs tuesday on wnet 13! Hey AlyzaKaila. Boober_Gorg reported that 4100 aired today on 6/20 on his local PBS station. And he says they'll go onwards with the 4100 episodes till Thursday. Most perplexing indeed. All I can do is tune in tomorrow and watch for myself, compiling names of new characters till my sources get back from summer vacation. Yeah, and I got 4085, the Healthy Foods Game. Oh well... se la vid. I actually was shocked to see a new episode aired. Maybe because by September, PBS will be teribly in disarray? Or maybe they just threw in one new episode to shut the fans up? Or it could have been a mistake. I guess it all depends on what episode airs tomorrow. As I've noticed with Arthur and BTL, they throw in new episodes randomly, mixing them up with reruns. Thought it might be new ones all this week on our local PBS station, channels 45/49 (which are sort of combined) but am now editing b/c I finally foudn that episode guide & it was one that was shown. It's the game show where they try to name foods of different colors. Kinda okay, but not inspiring. I did like the Elmo's World on eating where he says everyone eats (or something like that) "unless Grover is their waiter" and they show a snippet from a classic segment, Blue saying "waiter, where's my food" and Grover coming out, slipping on something,a nd throwing lots of food int he air. I just caught snippets while eating then cleaning up, though, so I didn't see much. Well, I did see Cookie doing Healthy Food as a rap song, and I was reminded why I can't stand rap. But he redeems himself by being in the closet eating a whole box of something, then the box itself, at the start of Elmo's World. in the last three years, the only segment shown on sesame street with kermit the frog has been do De Rubber Duck, where he is mostly a background character and only had one line. 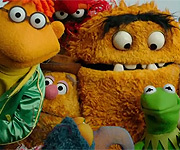 If sesame workshop is allowed (or willing to spend the money) to have show old kermit skits, then why show one where he is mostly a background character? couldn't some of kermits starring roles be shown in new episodes? or could the song "Subway" be shown sometime soon? Can you tell me if any other kermit songs or skits will be shown this season? after all, this season focuses on being healthy, and kermit did appear in a lot of health-related songs/ skits: the heart of a frog, sesame street news: cookie monster as little red riding hood, do op hop (okay, i don't know if this actually qualifies, but hopping is excersize), the skit where he x-rays herry monster, the skit where he helps proffessor hastings teach about parts of the body (i am guessing that this could be a health lesson), the skit where kermit and grover demonstrate short and long, and there could be some more that i either don't know about or forgot to mention. I may not be secret Squirrel, but I can tell you that is pretty doubtful. It all depends on how Disney is willing to negotiate with SW. I mean, they are trying to negotiate to have the SS characters stay in tact in releases of TMS season sets (at least, that's what I hear). So, they could work on a deal (slim chance, but anything is possible) to have KErmit segemts on the show, theoretically speaking. "If sesame workshop is allowed (or willing to spend the money) to ... show old kermit skits ... couldn't some of kermits starring roles be shown in new episodes?" Most likely not. You'll continue to see Kermit in compilation tapes, and the occasional appearance like Do De Rubber Duck, but for the most part the Workshop is concentrating on moving forward and making new material. There is a huge, huge library of material to choose from, and curriculum is the major criteria for deciding which sketches and songs end up in current rotation. 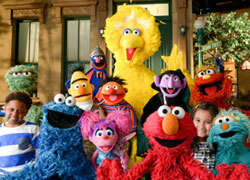 Even though Kermit is now owned by Disney, Sesame Street still has permission to use him. Even in new material, or just in archival stuff? I am pretty sure both.